Hello, my name is Ann, the main artist at Fancy Faces Face Painting in Las Vegas. I am excited for the opportunity to make your party or special event a BIG HIT through Face Painting! 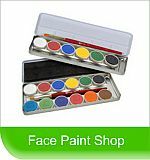 I have been in business since 2011 and have painted over 1,000 faces! Picnics, Birthday parties, Corporate events, fundraising, festivals ... most any event, wherever you need a smile, I can put it there!